Why are you fearful of tomorrow? Do you not know that the past is but a prophecy of the future? Have you forgotten so soon the times when I have picked you up off the burning sand and have carried you? Have I not told you I have engraved your image and likeness not only in the palms of my hands but on my heart as well? I know as you look into the future there are many unknowns. I know you are somewhat fearful of how you will render unto Caesar that which is Caesar’s. I know you are fearful your loved ones will fall into the hands of evil people who mean them harm them. I have felt your pain as trusted friends have hurt you deeply. I have felt your sadness at the loss of loved ones. I have felt your strength weakening as the Adversary has attacked you. I wish to reaffirm to you the Love of a God who has given you his All, holding nothing back even the point becoming one of you through my birth. 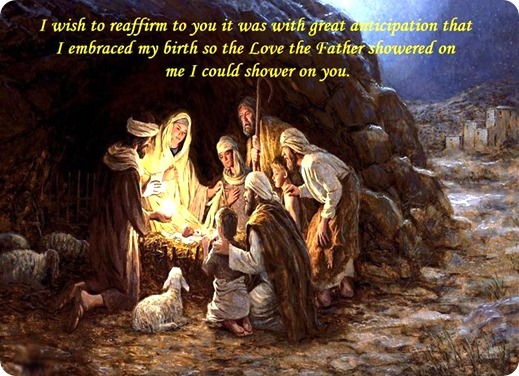 I wish to reaffirm to you it was with great anticipation that I embraced my birth so the Love the Father showered on me I could shower on you. You are loved with a love so powerful and lasting that it moved heaven and earth. Nowhere in all of history has someone been loved as deeply as my Father and I love you. Put you faith and trust in our love and journey into the future reassured that we not only go with you but in you and ahead of you as well!